As much of an annoyance buying a car battery is, installing the improper battery in your vehicle could cause harm to the vehicle. This could also harm the battery just installed in the vehicle which could overload the battery and cause the battery to no longer work, but in some cases cause the battery to ignite due to damage. This doesn’t mean it will happen to you necessarily but understanding the danger of working with a battery at such a high energy there is room for dangers to arise. Every precaution should be made when installing the battery, as well throughout knowledge of what you are doing will make all the difference in a car battery replacement. Normally, those looking around for a new battery in their car will be searching due to an event that caused their car to stop operating. A car no longer turning on, doesn’t automatically default to a bad battery, so wasting money on a battery that you don’t need isn’t immediately recommended until a determination is made. So lets go over the signs that you car battery is dead. Included Battery Replacement For All New Policy Holders! Enroll Today to Find Out More! Sometimes your battery may give you issues, that appears like you have an issue with the battery itself, but the system battery voltage is low. The easiest method to do so is by getting a battery checker(DC voltage) and use it as a car battery tester to check the voltage being output by the battery. If you are hovering in the 12v range, you know your vehicle is good while if you end up being lower than you will know there is a need to replace the battery. Is the original battery intended to work with this vehicle? 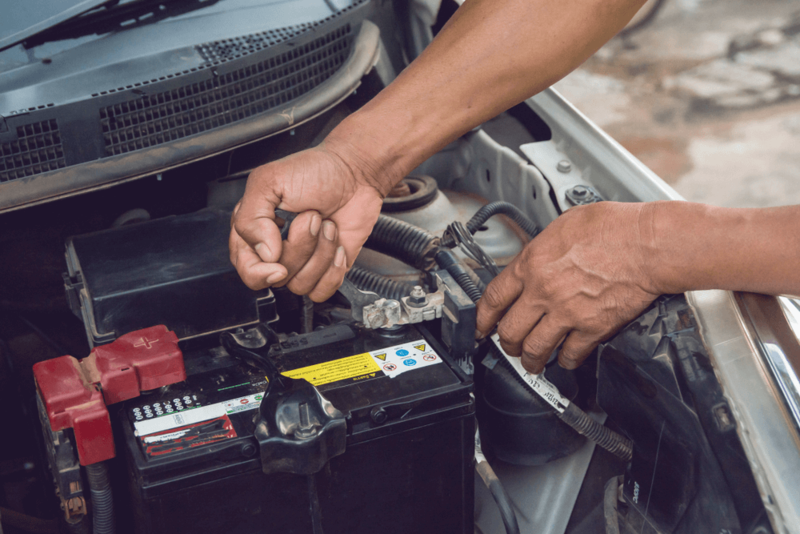 It may sound a little funny of a situation, but there are instances that car battery that’s inside your vehicle is the incorrect type for your specific model but works with the vehicle overall. Normally, this event occurs for cars with sport models that require more power. A Base Pontiac Firebird won’t have the same battery as an equivalent Pontiac Trans-am. They will just use a similar battery that is fitted for the car. Car batteries range in many different makes and models, but standard batteries reside in the 5-6-year range. Some batteries will even be sold with an extended battery life guarantee but will have an increased price tag from the other batteries on the shelf. Even if your car is not experiencing issues a car battery at that age should be changed to avoid leaking or immediate loss of power on the road. What are the cold cranking amps? If the battery is only causing issues in the cold you may have an issue with the incorrect cold cranking amps(CCA) on the battery installed. CCA is battery’s ability to start an engine in cold temperatures. Battery rating refer as to the number of amps a 12-volt car battery can deliver. How many cold cranks amp do I need? While at zero degrees Fahrenheit a battery needs to maintain a voltage range that is above 7.2 volts. Else, you’ll find out that the vehicle will be unable to cold crank start. Regardless, you may need to have the battery replaced but knowing it’s still a live battery may allow you to sell to recoup some loss. In some instances, your terminals may be covered or corroded. The easiest thing would be to unplug the battery, get a bit of sandpaper and clean car battery corrosion right at the source. Some pressure may be necessary, the result should show a cleaned terminal. Same thing goes for paint on the terminals, some manufacturers will leave paint on the terminals as a cosmetic choice but doesn’t work well for energy dispersion which causes the battery to negate to charge. The availability of batteries has become a bit more expansive over the years with a wide variety of models, makes and even composition. The main two compositions would be broken down between Lead-Acid Batteries, which are the most common you will find. The batteries are normally considered maintenance-free batteries, which consume less liquid than the traditional “flooded cell” batteries. These batteries tend to be less expensive but will not hold as long of a charge. Absorbed Glass mat batteries last are created to withstand constant charges and drainage. These batteries are slowly becoming the standard in newer vehicles that have “start-stop” systems, power outlets and additional features. For those who have a vehicle that is used periodically as opposed to often this is the best choice since degradation doesn’t occur as quickly. Searching for a battery is extremely easy, but extremely difficult at the same time. Easy in the sense that every local car parts shop’s site will mostly have the above widget as talked about but will offer only snippets of their inventory. For those looking for the cheapest option, multiple google searches will be required to find all the compared prices. But, will yield results regardless. For Our example, we’ll be looking at a new battery for a 2007 Chevy Impala. So, easily enough visiting AutoZone’s website will show you an area to set your home store as well as adding a vehicle to cater your searches towards. Thankfully, the site is intuitive enough to know that when you establish your vehicle it won’t require any additional steps (such as creating an account). You can then navigate to the top of the page and simply search for batteries either from the search bar or the drop down (the easiest with the widest range would be using the search bar). After you will see results for batteries, this is where you would select “car battery” from the options, to ensure you’re only seeing car batteries and not truck or marine batteries. Clicking this will you to see every battery AutoZone currently holds in stock and their prices and applicable core fees. (normally the core charge is one standard price throughout the site). You can then specify if you want to purchase and have it shipped, or to drive to any store and pick up in person. Depending on the retailer picking up the battery in person is recommended as they may install for free or at a reasonable price. This will be a big help in having to search for “how much does a battery cost” and frantically search google and dead pages. If AutoZone isn’t your desired location to purchase your battery from other retailers such as O’Reilly, Advanced Auto Parts, or Walmart all provide a similar system on their websites. Alternatively, you could look up “cheap car batteries near me” and Google will do it’s best to show you the shopping view of each battery. When purchasing a battery on your own there is a difference between some batteries, such as the two types listed above, but there is also smaller important factors needed to consider when selecting the correct battery. In most cases, choosing a battery with a lower required spec will cause the car not to start but won’t necessarily affect the health of the vehicle. Damage to the battery may occur. Cranking Amps measure the starting power of the battery. This is integral when purchasing a battery as certain models will fit with a car model but may not support the full extent of the vehicle’s requirements. Low cranking amps installed in a car could cause the car not to start or may damage the battery. SLI batteries deliver a large burst of power to a vehicle for a short time as needed, this will allow it to easily start an engine. The alternator then kicks in on the vehicle driving to feed the battery power, this will allow for the battery to be used normally in its life cycle. If a full depletion of this battery happens damage may occur to the overall health of the battery. Deep cycle batteries are exactly as they sound. The cycles that the battery outputs are made specifically to last significantly longer than that of a starter battery. These batteries support constant depletion and charging cycles. Newer vehicles, such as multi-passenger van use these batteries to support the plethora of features included in the vehicles such as USB ports, 12v charging ports and other amenities. Use a Wrench to disconnect the bolt holding the negative battery terminal onto the battery. Remove this and place to the side. DO NOT let the negative battery post touch anything metal or the positive terminal, as it could cause major damage to the vehicle and possibly injure the installer. Repeat the same step for the positive battery terminal, avoiding anything metal touching the battery post. Lift the battery upright out of the car, normally a battery will slide out but, in some cases, they may be more wedged in. This will require some force on your part to carefully extract the battery. Install the new battery by placing the new unit into the same area as the previous one. Once the battery is seated properly and lined up with the correct terminals the fix is as easy as simply screwing in the pegs. Take the positive terminal and reinstall both the nut and the terminal cable. Take the negative terminal and reinstall both the nut and terminal. Try to wiggle the battery inside of it’s installed compartment to ensure there is no movement. If there is movement readjustment is needed. Turn on your car and check the battery indicator, it may say it’s low at first due to the shelf time. After driving your car for a few miles, the battery should reconfigure to show the accurate charge. Consulting with your owner’s manual is one of the easiest ways to find information of about your vehicle and will often list the exact size, power and cold cranks your vehicle will need. Marking down any changes to a battery during is extremely important so you can keep tabs on when the car was maintained. Just the same, checking if your car has a prior warranty (or current warranty) you will want to use that to have the vehicle repaired. This will negate the worry of finding a new battery, the correct cranks and the hassle of getting it installed. If you are here due to a battery light on car illuminating, you may want to check out our article regarding the Car Battery Light to find reasons as to why your vehicle is throwing a battery light indicator. If you need to learn how to jump a car battery, we can also help pay for it check out our Ultimate® Savers Club!